Thousands of Northern Westchester and Putnam residents remain without power two days later. following Tuesday’s severe storm system that slammed the area, taking down trees and sending utility lines flying throughout the region and prompting an extensive recovery effort. Putnam, where a state of emergency was declared by Gov. Andrew Cuomo, was hit hardest , followed by parts of Northern Westchester. In Putnam, as of 10:15 a.m., 18,846 of NYSEG's 38,310 customers in the county were still in the dark. In Northern Westchester, 8,988 of NYSEG's 32,806 Westchester customers reporting outages are still in the dark. Among the hardest hit municipalities were Somers (4,705 outages reported as of Thursday morning), Carmel (4,426), Kent (5,105), Southeast (2,200) Putnam Valley (2,688), Patterson (4,320), Lewisboro (1,676), Bedford (811), Brewster (1,221) and North Salem (1,159). New York Gov. Andrew Cuomo was in Putnam on Wednesday to provide an update on recovery from the storm throughout the region, which shut down all Metro-North at its peak on Tuesday afternoon. 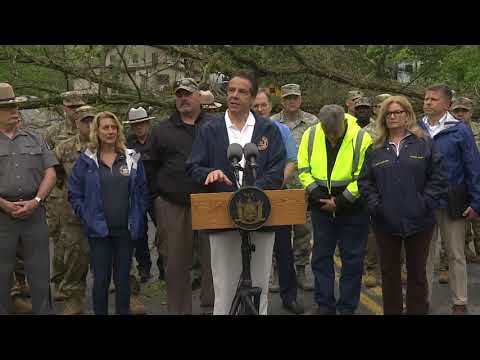 ""New York has once again withstood the fury of Mother Nature and now is the time for the state and our local partners to get communities throughout the Mid-Hudson region up and running again," Cuomo said. "Driving and accessing roadways may still be difficult and I encourage all drivers to stay off the roads in order for our crews to get our roadways clear and safe as soon as possible." Just 119 outages were reported to Con Edison as of Wednesday afternoon, impacting 339 customers. Recovery efforts are ongoing. Keep following Daily Voice for updates as they become available.